I so much enjoyed making a temperature quilt in 2018 that I've started one again for this year. While I did hexies for 2018, I've decided to just hand piece squares for 2019. It only takes a minute to add each square. The first column is January 1 - 15 and the last column on the right is March 16-31. Interesting to compare to 2018 - overall 2018 had more really, really cold days but also generally had more mild days. I'm very interested to see how the block of orange (temps in the 80s) and red (temps in the 90s) will look this year. There are so many temperature quilts popping up and I love them. I wrote up a tutorial on a temperature quilt if you are interested. In addition, Anina is running a 2019 QAL! Here is a mapping of the colors. This is such a neat record to be creating! OK, OK...I did one week in January.......I know. I keep the box on my cutting table so it’s not like I don’t know it’s there. Right? I'm behind. 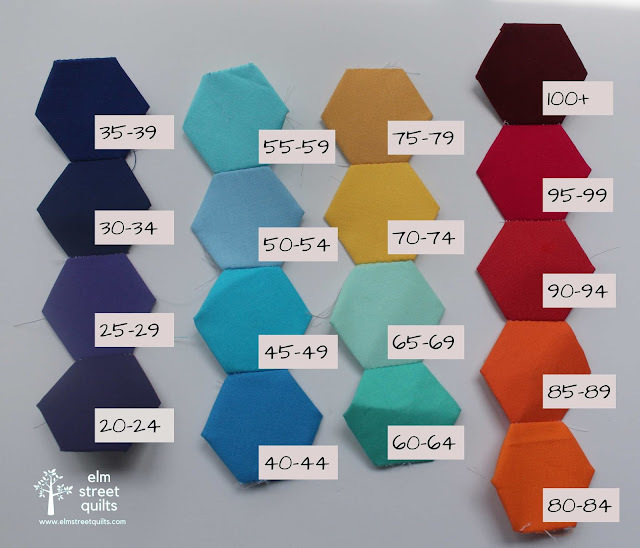 I've been keeping track of temperatures, and I have my fabric, but I haven't actually made any hexies yet. Yikes.....will have to play catch up soon.